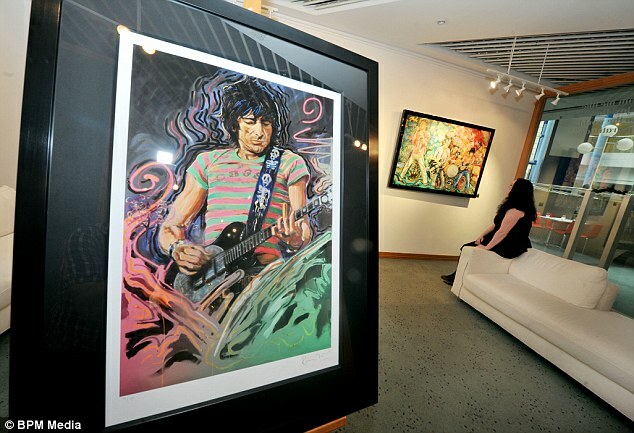 Today’s featured artist is Ronnie Wood!! 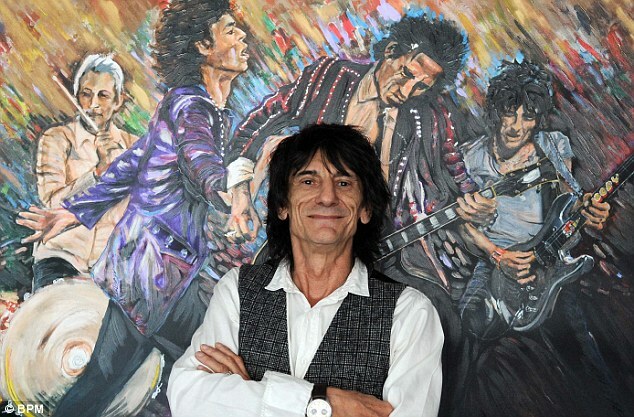 Rolling Stones guitarist Ronnie Wood could be in for some satisfaction after putting one of his paintings of the band up for sale for £300,000. 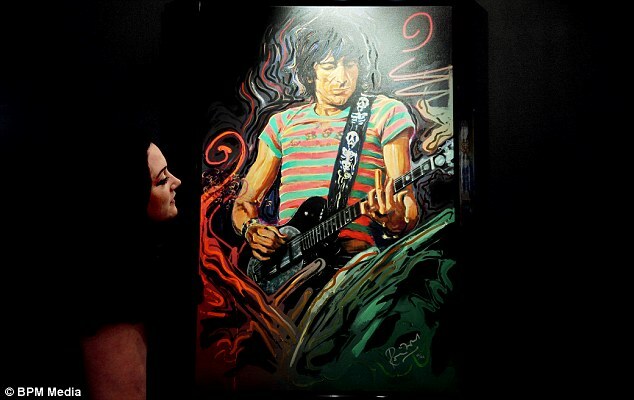 The rock ‘n’ roll legend’s painting of his band is 1.5 metres by two metres in size and on display at Castle Fine Art, at the ICC, in Birmingham City Centre. The 66-year-old, who listens to Mozart at his easel and whose first love was art, took formal training at Ealing College of Art, London. Wood said: ‘When I get inspired, I get almost possessed and I just have to paint. It was as a child Wood showed early signs of artistic skill. At school, he was pulled out of science classes to paint murals. When he was 14, his music teacher paid him £4 for a snow scene. Prices for Wood’s Raw Instinct collection range from £1,500 for a signed limited edition print. 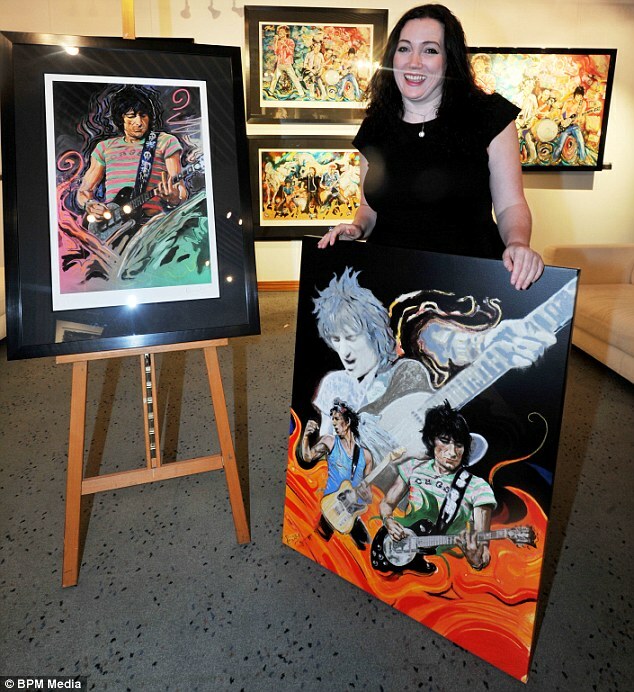 Gallery manager Beth McCarthy said of the 40 original works, about 20 were still available. She said the art gave an insight into Wood’s mind. ‘His life has been very well documented,’ she said. ‘He could have been a professional artist. ‘If you’re not necessarily a singer, but a musician, someone who creates music and writes songs, that gives people a sort of poetic sensibility. 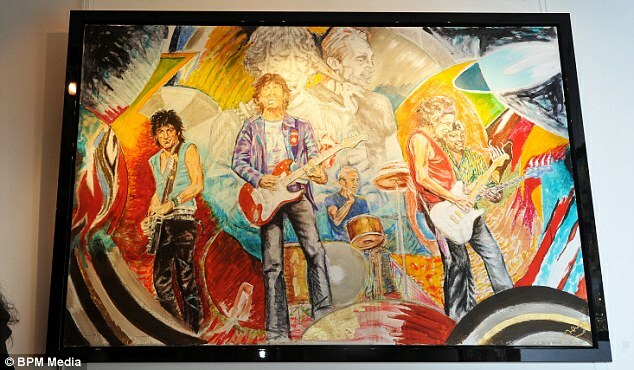 It will be followed by never-before-seen works by Bob Dylan in his Drawn Blank 2013 Collection. Beth said Dylan told the gallery he found art relaxing. She said: ‘It’s physically hard work touring night after night.